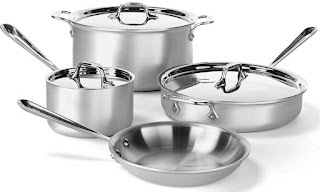 If your looking for new Cookware make sure to check out this sale and Save up to 69% on All-Clad Cookware Setsfor MOM! Which means this All-Clad Professional Master Chef 2 Stainless Steel Tri-Ply Bonded Cookware Set, 7-Piece, Silver for $299.99 (Retail $367.49). I know it is still pricey, but if you've never had a "GOOD" set of Cookware - then your missing out! It does make all the difference and last years! Pick up some Bar Keepers Friend too to help you keep them sparkle.